Sanyukta and Randhir are facing similar situation with their rights in question and in particular Sanyukyta is fighting for them while Randhir isn’t interested to get it. In this testing time, while Sanyukta tries to bring Randhir close to his mom Renuka but it is not easy for him to accept his mom. Sanyukta herself faces ploy from her brother Ankit and battles it out. 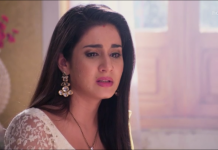 She is somehow coping with her problems emotionally and pacifies Randhir and to make him cope with his emotional turbulence. Both Sanyukta and Randhir are in love and she fully takes care of her responsibilities towards him even in challenging times. Later on, there is a iconic romantic rainwater scene with SanDhir grooving and dancing on one of the heartwarming musical tune – Kya Karu Haye Kuch Kuch Hota Hai from movie KKHH. They both drenched in water and Randhir comes close to her and finds a tattoo on her back with his name – Randhir. He gets awe to see Sanyukta’s endearing love for him and showers her a tight hug. So, SanDhir’s love, romance and sizzling chemistry is on cloud 9 amid difficulties. Will Ankit succeed in his ploy against Sanyukta ? What’s more in store for Sanyukta and Randhir’s endearing love story ? On another front, with Monsoon’s arrival also marks the entry of Season of love, to celebrate it, there is a special monsoon 1 hour episode on 17th July 2015 @ 6:30 PM with Sadda Haq and Swim team cast integration. Sanyukta and Randhir alongwith Rewa and Bhagat and their cast will be having a memorable outing. There is special SanDhir romantic dance to capture the essence of Monsoon being the season of love. All we can say, Love definitely finds opportunities to express it in sizzling manner. Time to immerse yourself in romantic nostalgia with #SanDhir as they dance to one of the most memorable tunes. #IconicSaddaHaqMoment Watch #SaddaHaq, every Mon-Sat at 6:30 PM, only on V!